Jason is the Brisbane electrician who heads up the team at Globe Electrical Solutions. He and his team of Brisbane electricians provide good old fashioned service at very competitive rates with an extensive knowledge of the electrical industry, both domestic, commercial and in undertaking Brisbane electrical contractor work. As your Brisbane electrician we are your local electrician, experienced in domestic electrical repairs and new residential electrical works. We do not have a call out fee during business hours which makes us different to just about every other Brisbane electrician company. If you have an electrical emergency call us immediately, we are available around the clock – $120 call out fee after hours. Jason is also an experienced commercial electrician and he and his team are experienced as professional and experienced in undertaking commercial electrical works. Jason and his team of Brisbane electricians are experienced electrical contractors undertaking electrical contract works for small and large projects. Call us and we will provide you a quote for your electrical project. We can help you with a new solar power system, helping Brisbane households save on their electricity bills. 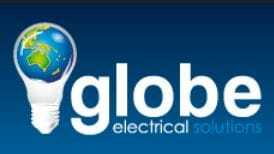 Globe Electrical Solutions have 25 years of experience in the electrical industry. We can assist you in getting all and any of your electrical works and electrical repairs completed on time and on budget. Our qualified Brisbane electricians are available to provide an efficient, friendly and prompt service at a fair and reasonable price. We are not a franchise. Thus, our lower overheads mean more savings which are passed on to our customers. We are confident in what we do. Therefore we offer a lifetime warranty on all of our workmanship. Our services as a nearby local Brisbane electrician range from small electrical repair jobs to the rewiring of your home. We have all the experience and knowledge that is required for any type of domestic electrical works that are required. So please call us if you require any help from a local electrician with work such as an extra power outlet, additional lighting (including security lighting), needing ceiling fans installed, needing repair to your electrical fuse-box or want upgrading of your total electrical system. Globe Electrical Solutions are experienced in managing and completing electrical contractor projects. We have undertaken many construction and refurbishment electrical contractor projects. As electrical contractors we have worked with large construction companies, medium sized development businesses and for individual homes, commercial and industrial premises. No electrical contract job is too big or too small for us. We have the skill and resources to help with small electrician jobs through to completing large commercial contractor projects such as new residential greenfield developments or high rise commercial builds. Globe Electrical Solutions are not a a large national electrical company, we are local Brisbane electricians. As we are only Brisbane based and live and work locally our overheads are lower than the larger electrical companies. We pass on this cost saving to our customers. So with Globe Electrical Solutions you will receive a high level of expertise and service, yet at a rate that is highly competitive. Our competitive rates apply to all the services our Brisbane electricians provide. We cover all electrical services, whether you need a local Brisbane electrician (domestic electrician) or Brisbane electrical contractors. Please do read some of our Google customer reviews and we would be happy to receive you call (0433 209 393).